From seated, close your eyes and fold the sides of your tongue inward for Sitali Pranayama (Cooling Breath). Inhale through your curled tongue like a straw. Close your mouth and exhale through your nose, creating a “ha” sound in the back of your throat. If your tongue doesn’t curl, practice with a flat tongue. Repeat this yoga cycle for several minutes. Open your eyes and place your right fingertips beside your right hip. Walk the fingers out, pressing the right shoulder blade into your back by externally rotating the shoulder. Inhale to extend your left arm up and exhale to reach it to the right, rotating your left shoulder back and expanding your left rib cage. Inhale, shift your gaze skyward; exhale, rotate your head and gaze at the ground. Exhale to release and switch sides, including the cross of your legs. With a long spine and grounded hips, bring your hands to Anjali Mudra at the center of your chest. On an inhalation, extend both arms up. On an exhalation, place your left hand on your right knee and your right hand on the ground behind you. Inhale to imagine your breath traveling up your spine and extending through the crown of your head. Exhale to press your navel toward your spine, externally rotate your right shoulder, and lift through the heart. Inhale back to center and switch sides. From Anjali Mudra, inhale to again extend both arms skyward, staying grounded through your hips. Exhale to reach both arms behind your lower back. Interlace your fingers. Gently press your shoulder blades into your back. Drinking in the breath, lift the chest upward. As you pour the breath out, bow forward and stretch your arms toward your head, releasing your forehead to the ground. Come to all fours, placing your wrists beneath your shoulders and your knees directly below your hips. Curl your toes under and spread your fingers wide, with the index and middle fingers pointing forward. Inhale deeply to lift the heart and hips. Exhale to round the spine, engaging your abdominal muscles and curling your chin to your throat. From Table Top, curl your toes under and press through all four corners of both palms to lift your hips, coming into Down Dog. Press through your heels, internally rotate your thighs, and press your heart toward your legs. Practice expanding your chest with every inhalation, drinking in, and with every exhalation, pouring out as the body stretches. From Down Dog, inhale to extend your right leg back, keeping the quadriceps engaged and pressing through the heel of your right foot. Ground through your left foot, pressing into the big-toe mound. Allow the shoulders and hips to remain level, without opening the body to the right. Step your right foot forward between your hands, stacking your right knee over your right ankle. Engage your inner thighs, curl the left toes under, press into the big-toe mound of your left foot, and lift onto your fingertips. As you inhale and drink in, roll your shoulders back and open your heart. As you exhale and pour out, surrender deeply into the hip stretch. Come to Down Dog then bring your right foot forward, resting the shin as close to perpendicular to the front of your yoga mat as possible. Activate your right toes and square both hips and shoulders as you lift onto fingertips. Inhale to roll your shoulders back as you puff your chest. Exhale to surrender and fold as your heart pours out toward the earth. Come back to Down Dog and inhale to extend your right leg back, keeping the quadriceps engaged and pressing through the heel of your right foot. Ground through your left foot, pressing into the left big-toe mound. Allow the shoulders and hips to remain level, without opening the body to the right. Open your hips, stacking the right hip over the left. Bend your right knee and eventually place the ball of your right foot on the ground behind you, turning your hips and chest toward the ceiling. Keep pressing through all four corners of the left palm and extend the right arm alongside your right ear. Inhale back to Three-Legged Down Dog, and exhale to Down Dog. Pivot your back heel and plant your left foot at about a 30-degree angle. If you draw a line back from your right heel, it should intersect your left arch. Inhale to lift your torso and cartwheel your arms open, bringing them parallel to the ground. Externally rotate your shoulders and extend through your fingertips. Drink in breath as you expand through your rib cage. Pour the breath out as you move deeply into your hips, bringing your right thigh parallel to the ground. Exhale to extend your arms behind the back and interlace your fingers. Externally rotate the shoulders and drink in, filling the rib cage and lifting the heart. Exhale to softly fold forward and pour out, surrendering toward the earth. If you feel strain in your hamstrings, only fold forward as much as is comfortable. To finish, inhale to return to Warrior II. Exhale to Table Top; open your knees the width of your yoga mat. 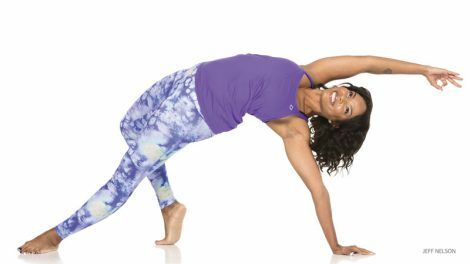 Bring your big toes together and slowly exhale, reaching your hips toward your heels and ankles as you fold forward and extend your arms alongside your hips. As you inhale, allow your rib cage to expand. As you exhale, soften through the heart and ground through the hips. After a minute, inhale to a seated pose. Lower to your back. Bend your knees, placing the soles of your feet under them. Press into your feet and inhale to lift the hips and open the heart. Interlace your fingers, pressing your hands down. Inhale, expand through the ribs; exhale, surrender your heart to service. If your knees splay, place a block between your thighs and squeeze. Exhale, release your hands and lower down. Extend both legs and lie comfortably on your yoga mat, turning the palms open. Press the back of the head into the ground as you deeply inhale and focus on drinking in, or filling up. On an exhalation, gently close your eyes and soften, placing your intention on pouring out, or offering unconditional love. Observe the breath as you absorb the benefits of this practice. If it is more comfortable, use a folded blanket under your torso and head.